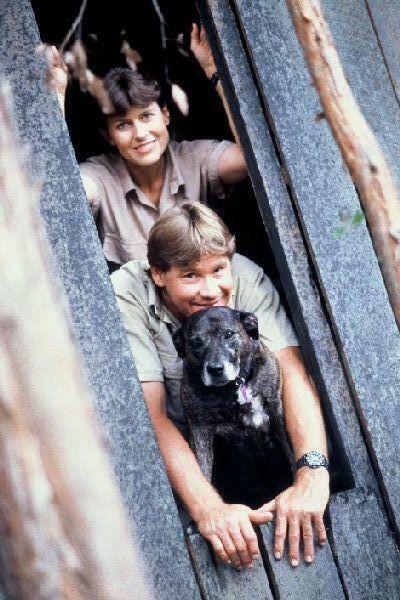 Steve, Terri, and their pet dog Sui. Great picture of Steve, Terri, and good old Sui. RIP Steve and Sui. steve irwin was a true role model he was an exquisit father and husbane and of course he was a true australian. he inspired millions of people across the globe he will always be in our hearts. I think that Terri miss Steve and rip Steve & Sui. I was in awe when I used to watched Steve...the croc hunter. How he loved life and everything in it. His love for his wife and family, his mum and dad, all the creatures on this earth were so special to him. He taught so many of us to respect reptiles that we at one time would destroy out of fear. As I sat and watched his memorial, tears were streaming down my face for the full hour and then some. My daughter's only wish was one day to meet this great man...no other star could compare to her feelings for Steve Irwin. May God wrap his arms around Teri,Bob,Bindi and baby Bob and hold them close..
May the work of this great man continue through his family and many friends...God Bless! Yesterday, we watched the Memorial. How wonderful and sad at the same time it was. There was not a dry eye in our house. May your legacy truly live on. It makes us all truly believe that life is so very precious. RIP Steve, you will be missed. Gutted! Devastated and grieving for a man that I never knew. He was unique and extraordinary; a good, decent man who adored his family and his work. My husband and I have carried an incredibly sad and heavy heart around with us since his tragic passing. My sadness is for Terri, Bindi and Bob - and the tears that I cry are for them. However, as I watch footage of them altogether I think - "your time together was short but how amazing that time has been!" Terri and Steve seemed a match made in heaven - they seemed destined to be together. I can therefore only believe, that Steve was taken for a reason - God has plans for him. I believe that his work has only just begun. Yesterday we watched the memorial service, and I couldn't contain myself, as well as my girlfriend. In tears we sat in silence, watching and remembering a man who changed the world, for the better, everyday. I looked at all my pets, all rescued from shelters, and I told them, that it is because of Steve directly that I became interested in animal rescue. Many have said that the animals have lost their warrior. true, but I for one, will work harder for Steve, for the animals. Rest in Peace Mate. Thank you for making me a better person.. Taught me to appreciate each day a little more than I used to cause anything can happen. ANYTHING. He went by the Rainbow bridge for Sui (and I'm sure other pets)and then on to his next journey. I miss him so, I cant imagine how distraught his family must be. Pat Smith, Meridian Mississippi U.S.A.
Today is the 16 september. I still can't believe, Steve is dead. Reading all the condolences, brings tears to ones eyes every time. It is simply tragic. Tragic and meaningless. Terri... God and Steve watches over you and your children. In time we will all join you Steve. See ya mate.No worrys. Crocs rules.